Finally, it is crawfish season! More and more restaurant s and stores are selling crawfishes. Every seafood market stores in Seabrook have huge signs “live crawfish” on the outside. And more excitingly, there are all kinds of festivals on weekends to celebrate these delicious “mud bugs” across town too. I love dining out to enjoy Cajun flavor crawfish boil. I also love make very hot and spicy Asian style crawfish boil at home. Boiling crawfish at home is quite easy and simple. My secret weapon is hot pot soup pastes which are sold in most Asian grocery stores. If you are into Asian style hot and spicy flavors, look for the authentic hot pot soup paste/ base manufactured in Sichuan Province, China. A lot of stores sell crawfish by whole sack. One single sack weighs from 30 to 35 pounds. But Asian market sell them loose; which means you can pick your own crawfish one by one with a thong. So if you go to the store early, you can get largest and most active ones. And don’t forget to bring a cooler for crawfish. Ice is available at meat/ seafood department. Anyone who works behind the counter would be glad to hand you a couple bags of ice if you ask nicely. As soon as we get home, I transfer crawfish from cooler to the sink. 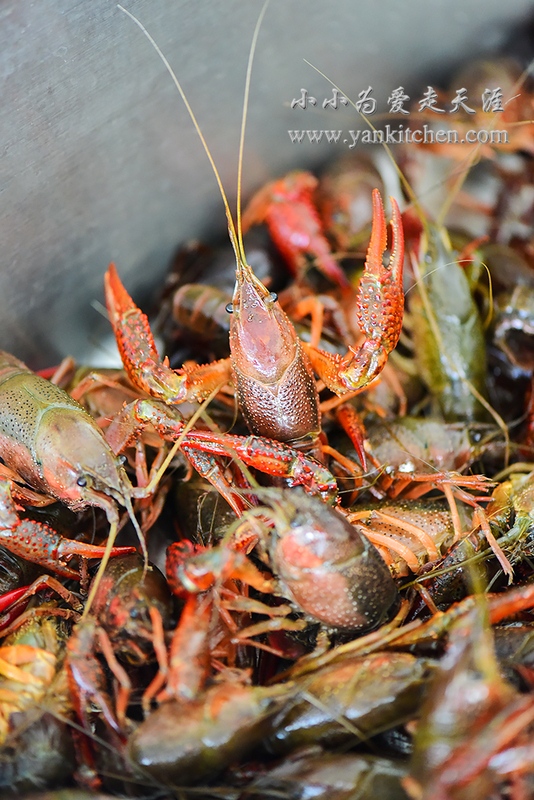 With a clean toothbrush, scrub each single one crawfish under running water. I sincerely doubt they would do that in restaurants. The easiest and quickest way to devein a crawfish is by removing the center part of its tail. All the crawfish has been cleaned and deveined. These are two of our highly recommended and favorite hot pot soup pastes. I use one of each to boil 8 to 10 pounds crawfish. However, 8 to 10 pounds crawfish is too much for a single pot. I always cook them in two batches. If you are not into spicy flavor like I do, just add the paste to your own taste. But do remember to add some salt if you cut back on the soup base. Heat a light weight cast iron wok over high heat. Add oil and garlic. Sautee the garlic for 1 minute or just until the garlic turns slightly golden brown. Stir fry for a couple minutes; add beer. Cover with lid and continue to cook for 8 to 10 minutes. Stir occasionally so that crawfish would be cooked and seasoned evenly. This is the first half crawfish. And this is the second half. I use a cast iron Staub perfect pan which is perfect for the job. TSINGTAO beer is very famous and popular across mainland China. It tastes very smooth, a little bit on the light side. It goes great with most Asian foods.